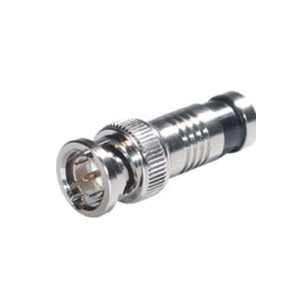 With the Cables To Go 41125 RG6 Compression BNC Connector, quickly customize the length of your home theater or broadcast video cables with these connectors. The Cables To Go 41125 RG6 Compression BNC Connector's Nickel-plated brass provides years of reliable service. Barbs within the connector centerpin provide a reliable signal path, and ensure a positive connection to the cable's center conductor. The Cables To Go 41125 RG6 Compression BNC Connectors are a breeze to install and more reliable and easier to use than traditional hex crimp BNC connectors.